Exciting news! I've teamed up my good friend and bag designer extraordinaire Clare Vivier to create two things we're going to wear all fall long--and beyond! 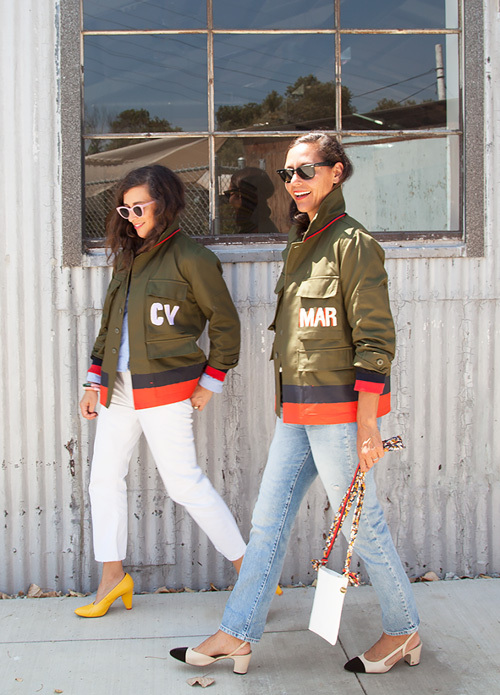 First, the MARMY, a military jacket, tricked out with hand-painted stripes, silk grosgrain ribbon around the collar, cropped, ribbed sleeves and the most universally flattering, one-size-fits-all fit. The hand-painted pocket monogram is optional, but you know I can't resist one, especially when I can do it various eye-popping hues. I plan to wear this jacket with pretty much everything in my closet, from jeans to midi dresses, under my winter coat and over my coziest sweaters. Also crazy cute is the Lauren cross-body bag that comes with a floral shoulder strap, room for your cell phone and wallet, and the perfect amount of clean leather for another monogram! Hi! Will you be restocking these? SO sad to miss! Love this!!! It's sold out. Will this be available again? Thanks!